KVFR provides Emergency Medical Services (EMS) to over 1,200 square miles to an area that roughly extends from Indian John Hill to Vantage west to east, and from Blewett Pass to the Yakima County line north to south. All other response services (fire and hazardous materials) are provided to the Fire District which is approximately 280 square miles. KVFR also contracts for fire protection in areas that border the District. Owners outside the District pay a fee equivalent to the property tax rate for residents. 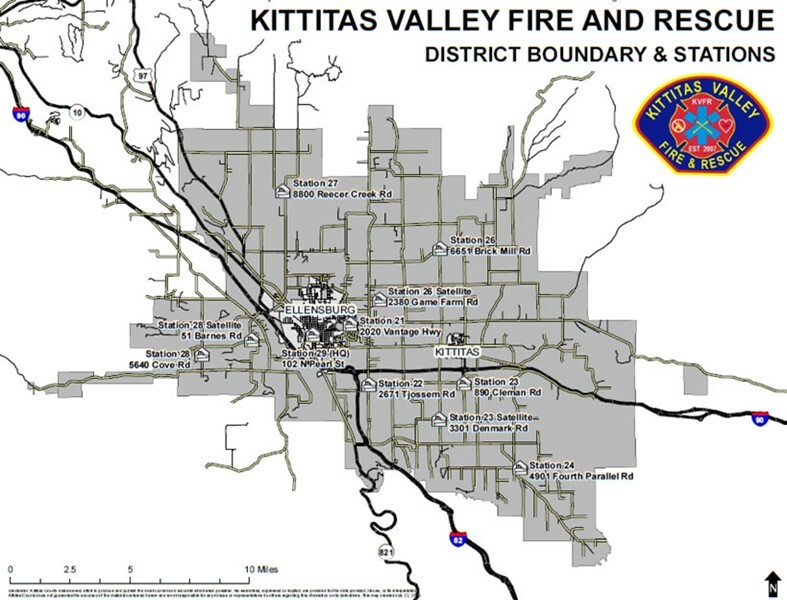 Kittitas Valley Fire and Rescue provides fire suppression, rescue, hazardous material response, and emergency medical services to areas within the boundaries of the fire district. The City of Ellensburg is included within those boundaries. KVFR also provides emergency medical services to a larger area which includes Kittitas County Fire Districts 1 and 4 and the City of Kittitas but is not primarily responsible for the other emergency services. Emergency Medical Services – KVFR provides a wide array of Emergency Medical Services including emergency response at the advanced life support level, scene transportation (ambulance) services, inter-facility transportation, and community paramedicine. In 2015, our service providers responded to over 3200 calls for service. Approximately 850 of those calls were for inter-facility transportation where our providers transport community members to medical care facilities that can provide the kind of care needed. Some of these interfacility transfers are emergent, meaning they are handled like any other 911 call for service and some are for stable patients where the transfer can wait for a short period of time while other emergency call volume is managed. Of the 100+ responders who comprise KVFR, 65 are certified at the basic life support (Emergency Responder and EMT) or at the ALS level (Paramedic). The balance are trained in 1st Aid and all of our responders are part of our EMS team. We are able to provide an urban level of service with highly trained providers, excellent equipment, progressive medical oversight and a close working relationship with Kittitas Valley Healthcare. The Kittitas Valley has been subject to numerous large and fast moving wild land fires in the past 5 years. Colockum Tarps, Table Mountain, Taylor Bridge, Snag Canyon in addition to dozens of smaller fires and fires that have occurred in neighboring counties or the Yakima Training Center. All of these fires were adjacent to or intermixed with structures or public infrastructure. KVFR is part of local, state and federal cooperative efforts in managing these fires. Our personnel and resources are routinely requested to respond around the State of Washington and those requests are filled when resources are available and KVFR can maintain services in Kittitas County. KVFR staffs a 9 member technical rescue team which is capable of providing confined space, high-angle rope rescue, low-angle rope rescue and support to Kittitas County Sheriff for water rescue. Non-team members are trained to the awareness level in all technical rescue disciplines. KVFR responds to all hazardous materials incidents inside our jurisdiction and mutual aid inside Kittitas County. Career staff are trained at the Operations level, with the balance of personnel all trained to Awareness. KVFR works closely with the Washington State Patrol in managing these incidents and typically responds to about 60 per year with most being small fuel spills or natural gas/propane leaks.